Menopause isn't just about you. The transition can have a negative impact on your relationships, especially when common emotional symptoms like mood swings and irritability are left unchecked. But, while it is near impossible to rid yourself completely of your menopausal symptoms, simply talking about them with your loved ones can help to smooth over any negative effects. 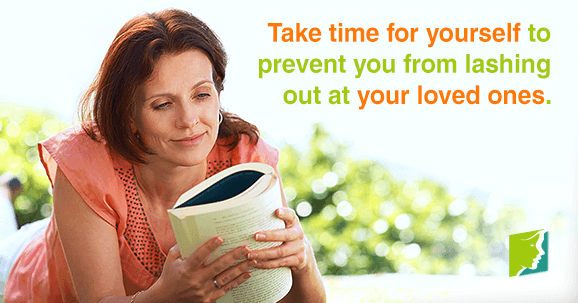 Keep reading to learn more about how to let your family know about your menopause symptoms. Many women are ashamed of their menopause symptoms and choose to hide them from friends and family. However, this is no reason for shame. All women will eventually go through this, if they haven't already. Be open with your loved ones and you could find that they are more understanding of what you are going through. Some of them may even be going through similar changes and you can provide support for one another. If you're going through menopause, you may have said or done things you normally wouldn't have. Perhaps these things have offended your loved ones. Don't be afraid to apologize, but also try to explain clearly what you are going through to your family. The point here is not to make excuses, but to foster understanding. If you find yourself feeling on edge, give yourself some alone time. Go for a walk, take a long bath, or engage in any other solitary activity that promotes inner tranquility. This will provide you with much needed space and puts less strain on your relationships. It could even help you manage your symptoms. If your menopause symptoms are especially severe, you may want to consider your treatment options. Most experts agree that combining lifestyle changes with alternative medicines can provide effective menopause relief. Try exercising more, eating healthier, and engaging in stress-relieving activities. Phytoestrogenic and hormone-regulating supplements have also been shown to be effective. Of course, it is best to talk to a qualified medical professional before embarking on any treatment regime, especially if you are taking any other medications. Click on the following link for more information about treatments for menopause. BMJ Group. "Menopause: What is it?" Patient Leaflet. 2007. Hopkins, Virginia. Lee, John R. M.D. What Your Doctor May Not Tell You About Menopause. New York: Warner Books Inc., 1996. Love, Susan M.D. Menopause and Hormone Book. New York: Three Rivers Press, 2003. Martin, Raquel. The Estrogen Alternative. Rochester, VT: Healing Arts Press, 2000. What Are the Most Common Symptoms of Menopause? The first symptoms of menopause typically begin as a woman enters her mid-forties. The first symptoms of menopause often include hot flashes, night sweats, and irregular periods. Click here to learn more about beginning menopause. How Do I Know if Menopause Has Begun? Is menopause just around the corner? Learn about the signs and symptoms so you can be best prepared for the next stage of life. Body changing in ways you don't understand? You may have reached menopause. Check out the signs and symptoms of menopause here.